When we went to the Holy Land, we stood at the Mount of Olives and looked at the Old City of Jerusalem. We spent a lot of time on the Mount of Olives because several key locations were right there: Pater Noster, which commemorates the Lord’s Prayer, Dominus Flavit, where Jesus wept over Jerusalem, the site of Jesus’ ascension into heaven, and the Garden of Gethsemane. 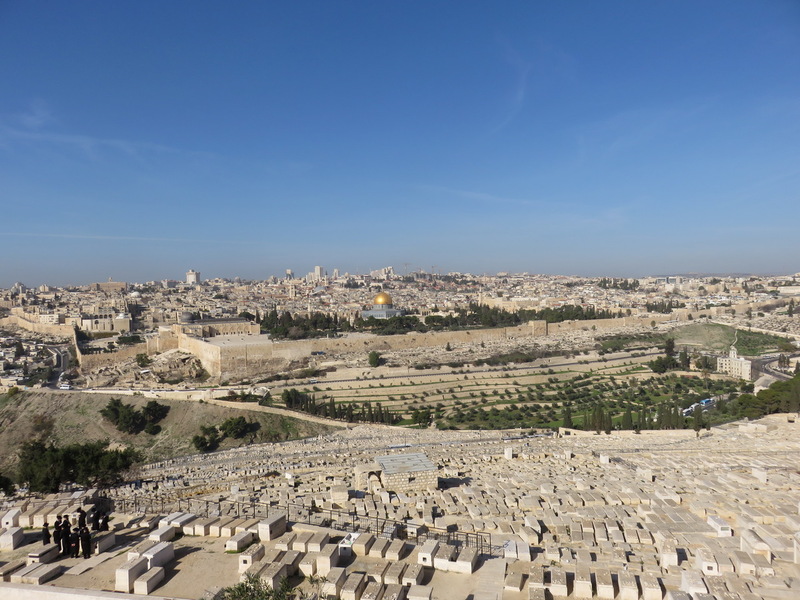 The Old City is quite an impressive sight, as viewed from the Mount of Olives. There is a valley in between which gives a perfect view. The Old City is surrounded by walls and in those walls, there are gates on every side. Usually, the gates are very busy with people coming and going. On the eastern side, however, we saw a gate that was sealed up and not in use. Someone asked what that gate was, and our guide told us that was the Mercy Gate. This gate was always called Sha’ar HaRachamim in Hebrew, or the Gate of Mercy. It is also commonly called the Golden Gate and has been sealed for at least the last 500 years. 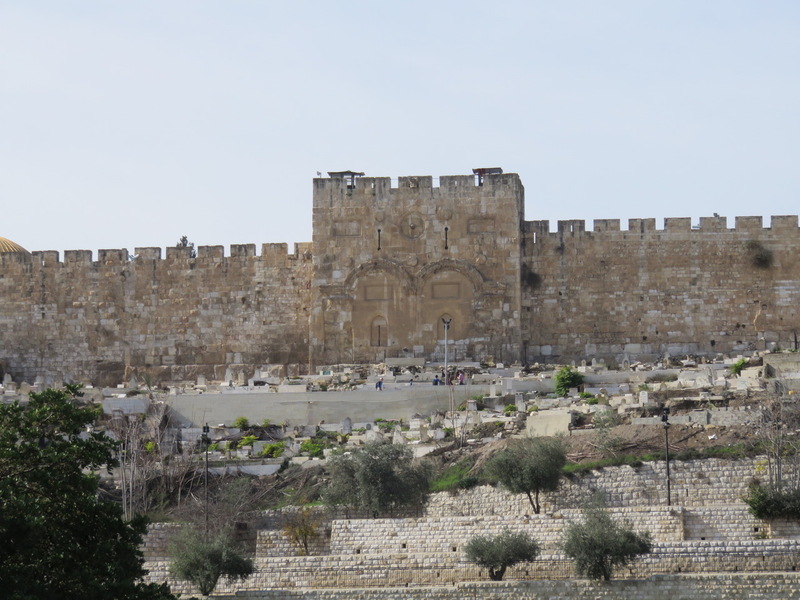 The current wall was constructed after Jesus’ time, but the original gate was there on the eastern side, lower down, probably underground by now. Some think the Messiah was prophesied to enter into the city through the eastern gate, the Gate of Mercy, in Ezekiel 44. This was the general area where Jesus entered into the city riding on a donkey, the event in Jesus’ life that is commemorated on Palm Sunday. I like to think of Jesus riding into Jerusalem through the Gate of Mercy, because Jesus Himself is the Gate of Mercy. Jesus is the Gate of Mercy because through Him, only through Him, do we have mercy, forgiveness of sins, life, and salvation. It’s fitting that we commemorate Jesus riding through the Gate of Mercy as we enter into Holy Week. Through His sacrifice on the cross on Good Friday, we receive mercy, and while we can’t go through it with Him, or understand the enormity of His sacrifice for us, we spend time in Holy Week, pausing, remembering, and praying in thanksgiving. Palm Sunday is the entrance to the rest of that blessed, merciful week in history. 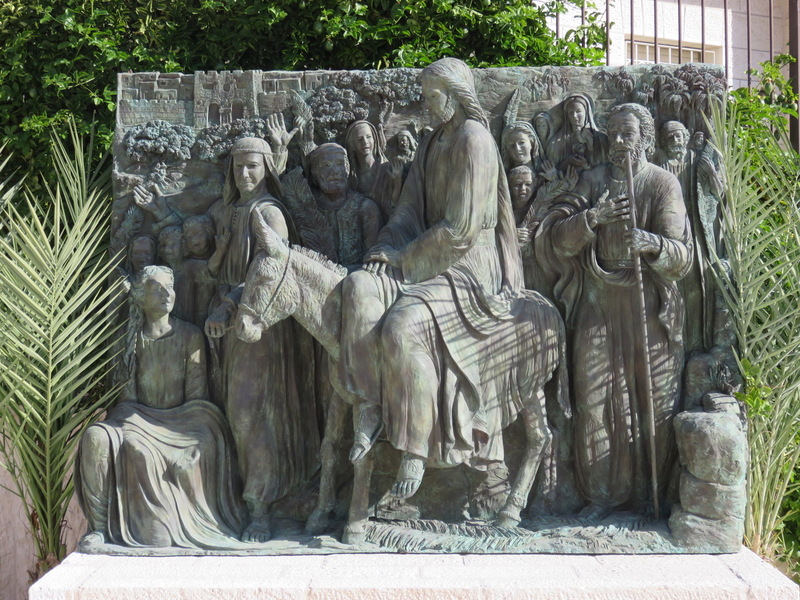 I liked being in Jerusalem thinking about Jesus riding on a donkey on Palm Sunday. I liked being in the same vicinity He was in, looking at the sky He looked at, and breathing the air He breathed. I know it looked different than it did back then, but still the awe was there. I liked very much that He rode through the Gate of Mercy to become Mercy Himself. Then He rose again from the dead to defeat death itself. We still look to the east, the sunrise, as a reminder of the resurrection of Christ. This is the victory of Easter. The whole week comes together. All of the Bible fits together, the Old Testament and the New Testament. On Palm Sunday, we will say “Blessed is He who comes in the name of the Lord” as was prophesied in Psalm 118 and Zechariah 9 and fulfilled on Palm Sunday. It will even be fulfilled again, because Jesus is coming again. It was, is, and ever shall be. We know this, we remember this, but do we often let ourselves feel awe about it? Holy Week is just about here. May your Holy Week be a beautiful week of awe, joy, and thanksgiving to our Lord who came, stood upon this earth, rode a donkey through the Gate of Mercy, died on a cross, and rose again from the dead, all to rescue us and claim us, even us, for His own. That is Mercy.